The tender usually takes you up the river (keep an eye on the banks for huge monitor lizards) then drops you almost in the center where there's lots of cyclos waiting to give you a ride - well worth it. Apart from that it's easy to walk about. Modern-day Malacca is a vibrant old city that belies its wealth of history. Visiting Malacca is a unique experience; its rich historical background earned it a World Heritage Site designation in July 2008. Malacca is the historical state of Malaysia, rich with heritage buildings, ancient landmarks and colonial structures. It was here that colonial forces first made contact with Malaysia, which eventually shaped the country into its current economic and political system. Today, in Malacca, you can still see the imprints of British, Dutch and Portuguese forces left behind in forts, museums, churches and towers. A cab will take you anywhere you want to go for a fee. You can hail a taxi where ever you are from the road, as they pass by many routes. Do try to bargain your fare; although they are required by law to follow a meter, most do not so you can set the amount before boarding. The trishaw pullers will take you to all the major tourist sites; they know them all like the back of their own hands. If you decide that the trishaw is the thing for you, then it would be helpful for you to know that you will be able to get them at the Dutch Square and outside the Mahkota Parade shopping center. About $15 an hour. 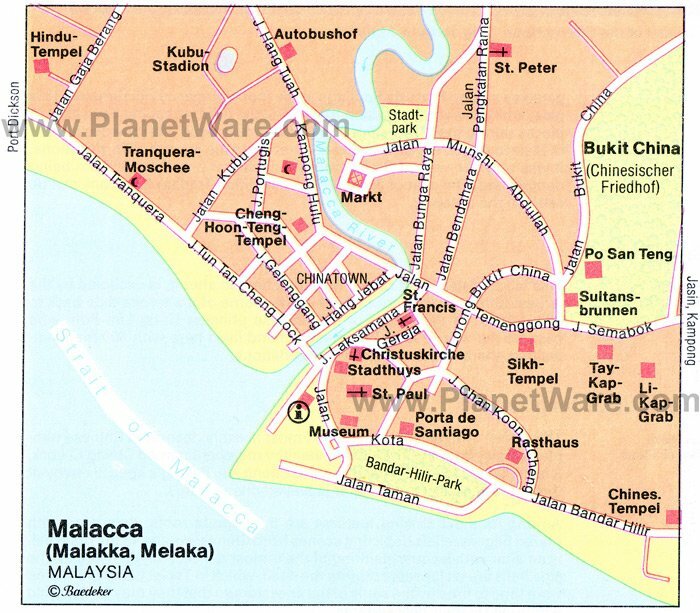 Malacca is also small enough to see on foot. In fact, there is nothing better than walking around this town admiring its pretty sights. Geok Hu Keng Temple - Located at the junction of Klebang and Jalan Pokok Mangga, This temple has a history of 130 years. Kampung Morten - a village of traditional houses, it is located on the west bank of the Malacca River. Recreational Forest Ayer Keroh - The 359 ha (887 acre) Ayer Keroh Recreational Forest was opened on April 17, 1984 and offers visitors peace and tranquility within its cool green surroundings. Melaka Zoo - Located in Ayer Keroh, along the main road from the Ayer Keroh toll plaza to Melaka town. One of the best, if not the best, zoo in Malaysia. Even better than the National Zoo. The zoo is located in a reserved forest where the animal enclosures more resemble the animals' natural habitat. The trees within the zoo compound provide ample shades for visitors during hot and sunny days.